Front seats: Bobike Mini+ (up to 15kg) Windscreens Rear Seats: Bobike Maxi SC, Bobike Maxi+, Bobike Maxi City, Bobike Maxi Tour (all up to 22kg), Bobike Junior (up to 32kg). Accessories: Bobike brackets, Bobike Spare Parts, Children's Helmets. We are running down stock of older Bobike models, spares and accessories, with a view to restructuring the site. Seats are priced at RRP but come with a free children's helmet, coloured Blue or Pink. Flags are used by each item to show where it will be sent from. UK: , Holland: . Delivery usually takes 1-2 working days (by UPS, or 3-4 by Hermes) from UK stock, next day possible for seats ordered before 12 noon, smaller items before 4pm. Seats are sent and delivered Monday to Friday, Accessories are posted (Royal Mail First Class) Monday to mid-day Saturday. Delivery from Holland usually takes 6-10 days. When your seat is shipped you will receive a tracking number. Some recent tracking numbers are: P2G58237550, P2G58751600 and P2G58819140 , delivered in March and April 2019. Prices include UK delivery (including NI and islands). For international orders, please order first and we will send an email to finalise shipping costs, or email an enquiry. We are happy to answer pre-sale questions on fitting. 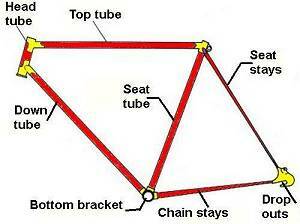 Sending an email with a photo (or link to a photo) of your bike works best, but please first look at the brackets page. Front seats can be fitted to bikes with suspension, rear seats cannot. After sales. we are happy to swap brackets if you've chosen the wrong one. Returns (UK): We arrange collection of seats by courier and give a full refund. For smaller items return postage will be refunded (this has been our Returns Policy since February 2010). We are flexible on return dates. Last updated: Tuesday 9th April 2019. Tracking numbers updating. The now discountued Bobike Mini+ front mounted bicycle child seat. For children from 9 months of age to 15 kg weight (~3 years age). The child must be able to support the weight of their head unaided for the duration of the ride. Complies with BS EN 14344:2004. The seats are made in Holland (www.bobike.nl), except the four designs labelled PS which are made in Portugal. The seat cushions are attached by Velcro. We supply the Bobike Mini with one of four mountings: (1) the original Quill Stem Mounting Block, mainly for 'Dutch' bikes and lower end or older Mountain Bikes (2) the ATB bracket, for mountain bikes with a non-sloping cross bar, free of cables, (3) the Universal Mounting Block , which fits threadless headsets, and (4) the Mini 1 Frame Bracket, which is an option for step-thru bikes with aluminium alloy stems and some folding bikes. . Please click on the links or see the brackets page for details of each bracket. Prices shown are for Mini+ seats with a Quill Stem Mounting Block, the other mountings add £10 to prices (use Bracket Option, Add to Cart). Price £59, incl. UK delivery in 1-2 days: PS All Grey, PS All Blue, PS All Green, PS All Yellow, Plain Black, Allstars Blue, Basil Rosa BT, Batavus Black, Black Champion, Bolli Black, Camouflage, Fiori Purple, Isis Grey, Gothic Black, Leaf Pink BT, Man Tribe, Multi Stripe, Peony Pink, Peony Pink BT, Purple Fish, Retro Brown, Sky, Splash ST, Splash BT, Starlight Black, Starlight Blue, Summer Stripe, Sweet Girl (Pink), Sweet Pink, Tribal Colour. All patterns are priced at £59.00 including delivery by Hermes (2 to 4 days). Bobike Mini assembly and mounting instructions (400.8Kb, includes English) . The same in JPG format: C1, L, Steps, p5, p6, p7, C2. TEST MAGNET and BRASS PADLOCK. We include a magnet which can be used to check your Quill Stem or Steerer is made of steel, and a small padlock to lock the seat in place (if you wish, see step 5 on page 5 of the instuctions). The magnet should stick, if it doesn't the stem/steerer could be stainless steel (okay) or alumnium alloy (not okay). Please seek further adivce if the magnet does not stick. The padlock can be used with all four mountings. Archive: Bobike Mini+ voted 'Mumsnet Best Children's Bike Seat, 2011'. 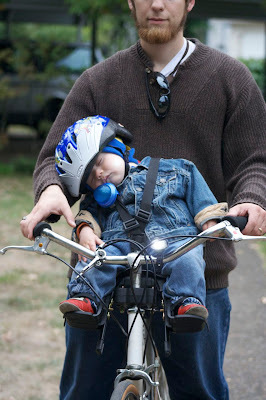 Younger children's heads seem to flop to the side when they fall asleep (examples: #1, #2, #3) in which case it will (I believe) be safest to cradle them, to push the bike, or to stop completely. Older children seem to be able to sleep and hold on, in which case they can use the Mini Handlebar as a 'sleep roll' ( example, aged 2½). WINDSCREEN FOR BOBIKE MINI. Attaches to the Quill Stem Mounting Block or Universal Mounting Block, but not the ATB or Mini-1 brackets. The windscreen come with either a pre-2011 cloth skirt, or a post-2010 semi-rigid foam skirt (the foam is about 5mm thick, and is similar to the seat cushions). £19.00 UK stock, delivery in 1-2 days: Plain Black, Gazelle Bloom, Isis Grey. Sky, Summer Stripe. £19.00 UK stock, delivery in 1-2 days: Bubble Blue, Camouflage, Leaf Blue, Max2 Flower Blue, Roman Black, Rozenbrot, Multi Stripe, Starlight Blue, Splash, Travel. £19.00 incl. delivery from Holland in 6-10 days: Basil Rosa, Cross Orange, Evline Black, Gothic Grey, Italic Black, Leaf Pink, Pattern Black, Pattern Champ, Roots Cell Black, Roots Cell Red, Roots Cell Grey, Roots Grey. BOBIKE MAXI SC rear seat, with ATB mounting bracket. Introduced in 2004, it is the simplest and lightest Bobike rear seat. A 4.5 x 2.25 inch (105mm x 55mm) reflector built into the back. The harness has a child proof clasp, with length adjustment by buckles and variable loops at the top. Foot protectors are available as an option. The seat does not meet EN 14344 which was introduced in 2005. As of 2013 the Maxi SC is discountinued by the manufacturer. The seat can be attached to a bike by two means: (1) using the standard bracket to attach to the top of the seat stays, or (2) using the ATB bracket to attach to the seat tube. In both cases the the foot rests attach to the bottom of the seat stays by means of lower wingnuts (included). A 4.5 x 2.25 inch (105mm x 55mm) reflector is built into the back of the seat. For children 9 months to 22kg (~6 years). (more info). Discontinued, no stock: Roman Black, Splash (Roman Black and Splash include a Rain Cover: deploying, deployed ). * This seat ships with the ATB bracket for more general compatability. If it turns out the ATB bracket is not needed, it can be returned for a refund of £10. If you are sure you do not need the ATB bracket please send an email after placing your order - we will refund the £10 and not include the ATB bracket (if you later decide you need the ATB bracket, we will send it to you, for £10). For children 9 months to 22kg (~6 years). Complies with BS EN 14344:2004. (more info). UK stock. Price £80.00 incl. UK delivery in 1-2 days: Plain Black, Isis Grey, Max2 Flower Blue, Roman Black BT, Purple Fish, Splash BT, Summer Stripe, Travel. from Holland, Price £80.00 incl. UK delivery in 6-10 days: Bubble Blue, Leaf Blue, Multi Stripe, Retro Brown, Starlight Black. UK stock. Price £93.00 incl. UK delivery in 1-2 days: Roman Black ST, Simply Black, Splash. (all including Rain Cover: deploying, deployed ). BOBIKE MAXI CITY and TOUR seats, introduced in 2010, have an improved harness, all-round double skin construction and a revised aesthetic. The new harness releases from the top, so it doesn't need to be lifted over the child's head and helmet, and plugs into the back of the seat at a number of heights, to fit for different sized children. The City seat is the lighter of the two, and is suitable for shorter journeys (due to the lack of upper body support). The tour is heavier, having a shield surrounding the back of the child's head, to allow resting on longer trips. The back of the Tour seat can be raised and lowered so that the shield and harness are at the correct height. A built-in rear light is standard on the Tour, and an option on the City seat. Both seats had a 3-point bracket from 2010 to 2012, and a single point bracket which performs the function a a rear rack from 2013, allowing rack mounted seats to be mounted to it. The distance between the leg supports is 170mm 20mm below the level of the seat. The leg supports are slighly flayed and can be bent a bit without straining them, so the Bobike City and Tour should be usable with carrier widths up to 180mm. * 3-point padded harness with reflective strip. The harness plugs into the back of the seat at 5 different heights (25 to 39cm) to adjust for the child's growth, and unplugs to fall forwards. The harness does not need to be lifted over the child's head. The Bobike Maxi City is slightly lighter than the Maxi Tour and does not have the telescopic back or head shroud. It is intended for shorter journies. The main features of the seat are its sturdy double skin construction and the harness which is opened and closed at shoulder level, so it doesn't need to be lifted over the child's head. From 2010 to 2011 the seat mounted on to a three point bracket (one that attaches to the bicycle frame at three points: the seat tube and both seat stays). From 2012 a rear carrier mounted version became available, which has a mounting plate that is bolted to the bike's rear carrier. For bikes that don't have a suitable rear carrier, two brackets are available: a single point bracket is available which attaches to the seat tube, and a version of the three point bracket . We have priced the 3-point mounted version at £90, the rack mounted version at £95 and the rack mounted version with the 1-point mounting bracket at £125. We offer all colours as rack or three point mounted by swapping the brackets around. The following colours come from the manufacturer with the 3-point bracket and will have two holes drilled inside the storage box to convert them to rack mounted: Isis Grey, Multi Stripe, Retro Brown, Sprinkles, Sky, Travel Black. Suitable for bicycles with wheel size 26 to 28 inches. Not suitable for bicycles with a carbon frame, suspension (including frame suspension) or an auxillary motor (e.g. electric bikes). Bobike Maxi City/Tour User Manual, 3-point mounting system (scanned, 1,352Kb, in English) . The same in JPG format: Cover, Key, S1, S2, p5, p6, p7. UK stock, £90.00 to £125.00 including UK delivery in 1-2 days: Urban Black, Urban Blue, Urban Green, Urban Pink, Grey Blue, Isis Grey, Multi Stripe, Retro Brown, Sprinkles, Sky. Special Offer: £10 off Urban Black model with the supersized branding on the back: photo. Email for details. * 3-point padded harness with reflective strip, reaching from 27 to 49cm depending on back extension. The harness unplugs to fall forwards. It does not need to be lifted over the child's head. The following colours come from the manufacturer with the 3-point bracket and will have two holes drilled inside the storage box to convert them to rack mounted: Isis Grey, Multi Stripe, Retro Brown, Sprinkles, Sky, Travel Black. Suitable for bicycles with wheel size 26 to 28 inches. Not suitable for bicycles with a carbon frame, suspension (including frame suspension) or an auxillary motor (e.g. electric bikes). £95.00 to £125.00 (including delivery within the UK). UK stock, UK delivery in 1-2 days: Urban Black, Urban Blue, Urban Green, Urban Pink, Isis Grey, Multi Stripe, Retro Brown. Bobike Junior seat, with 3 bracket options and lap strap. For children able to balance themselves on a seat without sides up to 32 kg weight (~5 to ~10 years old). The seat can be folded flat and the rear rack raised, to use as platform for luggage (the two small red buttons release a wire back stop). We supply the Bobike Junior with one of three mountings: (1) the Standard Mounting Bracket, mainly for 'Dutch' bikes (2) the ATB bracket, which fits most bikes in the UK market, and (3) the Universal Bracket , which gives greater scope for adjustment and fits most bikes, including smaller frame sizes. Please click on the links or see the brackets page for details of each bracket. The photos on the left show the ATB bracket. The foot rests are included and prices include UK delivery. from Holland, delivery in 6-10 days: Plain Black. Sky. Travel. Do not allow the child to use the foot rest as a step to climb onto the seat. If you think they have, please check the two lower locking nuts are at the same height (are level) and have not been dislodged. Foot Protectors/Foot Guards/Foot Plates for the Bobike Maxi SC, Maxi+ and Junior. They block off the moving rear wheel. UK stock, incl. UK delivery in 1-2 days, price includes delivery. Bobike Spring Guard. A plastic shield that clips over seat springs to keep fingers out. Intended for use with seats of the type shown in the second picture and rear mounted child seats. Bobike Extension Set. Extends the length of the 'Footrest Tube' for the Bobike Junior, Maxi SC and Maxi+ seats by 55mm. The 'Footrest Tube' is marked in green and labelled 'B' in the diagram to the left, which is clickable. Very few of our customers have needed these, and they've been bought to fix a problem discovered when trying to fit one of the three seats. £11.00 incl. UK delivery ( UK stock delivery in 1-2 days). Bobike Bike-A-Way Voetenzak for Mini or Maxi. £33.00 incl. UK delivery ( UK stock, delivery in 1 to 2 days). Bobike Poncho. The back of the Poncho fits over the back of the Bobike Mini+, Maxi SC, Maxi+ (but not the Maxi City, Maxi Tour or the Junior). A draw string runs along the lower edge, allowing it to be drawn to the seat. The poncho has a hood with a draw string around the face opening, outside of which runs a (2 inch, 5cm) transparent cowl, which extends to form a (5 inch, 12 cm) peak at the top. Below the chin, the top 4 inches (10cm) of the poncho can be opened or closed by Velcro strips. At the back, the poncho does not go all the way down, but clips over the back of the child seat. The part that fits over the back of the seat has a horizontal strip of reflective beading (3mm x 20"). From the neck to the bottom of the skirt is 30" (76cm), total length including the hood is 39" (100cm). The zipped storage pouch has a elastic loop, which streches from 7 to 14 inches (18 to 35cm) in length, to fasten it by (* do not attach it the the back of the child seat, or any other part of the bike, in case it snags on something. It could be put behind or under the child). . The poncho can also be used as a rain cover for the seats it fits. £17.95 incl. UK delivery ( in 1-2 days.